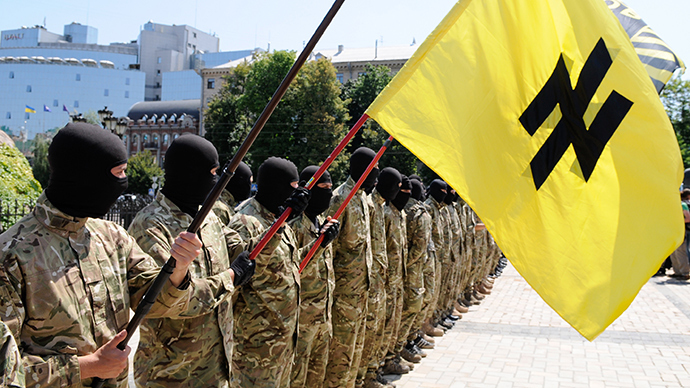 There are no officially registered far-right organizations in Ukraine, the security service head said. Foreign observers have repeatedly pointed out that ultra-right extremists are actively participating in Kiev’s military operation in the east. “We have no information available about any kind of radical far-right parties, organizations or groups,” the head of the Central Investigation Department of Security Service of Ukraine (SBU), Vasily Vovk, told Ukraine’s ICTV channel. “Certainly, there are people with different views who could pose a certain threat. Probably, there are unofficial groups sharing such [extremist] views, but in this case we deal with individual cases. Ultra-radical groups and organizations are neither registered, nor identified [in Ukraine],” Vovk said. The statement from the SBU boss came a mere two weeks after Ukraine’s leader of extremist group Right Sector, Interpol-wanted Dmitry Yarosh, was appointed as an adviser to the chief of general staff. He has agreed to legalize thousands of fighters as an assault team subordinate to the regular army. 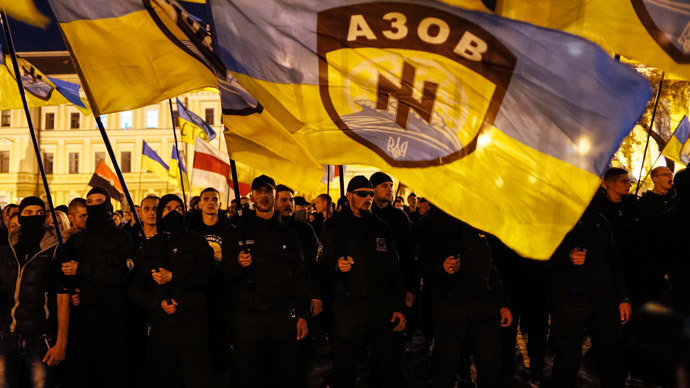 Heavy presence of Ukrainian ultranationalists praising Nazi ideology has been exposed on many occasions. 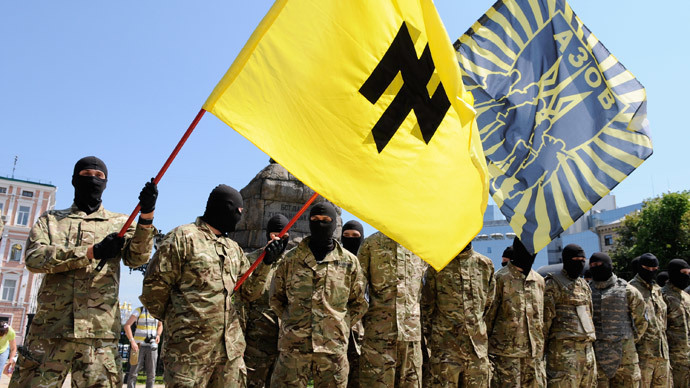 In early March USA Today reported from headquarters of Ukraine’s Azov volunteer battalion that a considerable part of its members open support Nazi ideology. Last year, troops from the Ukrainian Azov and Donbass Battalions were reportedly observed wearing swastikas and SS badges. According to a video on German TV station ZDF, Ukrainian soldiers were shown wearing swastikas and the ‘SS runes’ of Adolph Hitler’s elite corps. The footage was shot by a camera team from Norwegian broadcaster TV2. Last year BBC Newsnight journalist Gabriel Gatehouse paid a visit to Kiev to investigate the links between the new Ukrainian government and neo-Nazis. Having reported "groups of armed men strut through [Maidan] square with dubious iconography" – including German symbols used by SS divisions during WWII – the British journalist’s investigation found that "the most organized and perhaps the most effective were a small number of far right groups." "When it came to confrontation with the police, it was often the nationalists who were the loudest and the most violent,” Gatehouse said. On April 18 Vasily Vovk made a statement that the Ukrainian Insurgent Army (UPA) organization that had allegedly taken responsibility for murders of journalist Oles Buzina and ex-MP Oleg Kalashnikov, who were gunned down in Kiev last week, does not exist. During the WWII cognominal Ukrainian Insurgent Army composed of Ukrainian nationalists fought on the side of Nazi Germany. Also on Tuesday, SBU’s Vasily Vovk advised the ‘Ukrainophobes’ to play down their rhetoric with the regard to a number of high-profile deaths that have taken place in Ukraine lately. “As a head of Central Investigation Department, I believe that at present time, when there’s practically a war out there, the Ukrainophobes should either shut up or play down their rhetoric to zero level. There should be no people making a stand against Ukraine and Ukrainian-ness,” Vovk said. Last Friday, UN General Secretary Ban Ki-moon released a statement expressing "serious concern" about the spate of murders in Ukraine, demanding a thorough investigation that will restore "the primacy of law." “This string of deaths has put the Ukrainian authorities in the hot seat,” wrote Amnesty International. Last week an online database of ‘enemies of the state’ was exposed in Ukraine. The volunteer-made website dubbed ‘Mirotvorec’ (Peacekeeper) posts very thorough and comprehensive information on anyone who happens to make the list – journalists, activists, MPs opposing the current Kiev authorities' policies and rebels fighting against the government in the east. The information includes addresses, phone numbers and other personal info. The website enjoys the support of at least one high-profile Ukrainian official: Anton Gerashchenko, an adviser to the interior minister and member of the Ukrainian parliament.